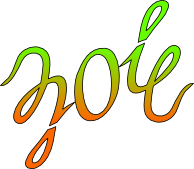 Depending on the length of the two selected names and whether their letter shapes will "play nice together," some pairs of names can be turned into each other, either as a reflection or a rotation. ​married couples, parent and child, twin siblings, etc. When the name "Cynthia" is rotated 180 degrees, you can read the name "Wilfred." 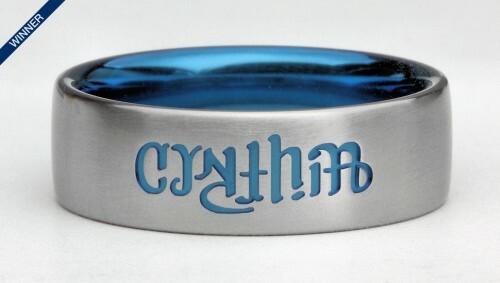 This design won a contest, and was engraved on a titanium ring. The letters "CLAN," when rotated 90 degrees, become the initials of the four people in this family. So far we've been dealing with only one or two names at a time. Now we're getting a whole family of names in on the act ... Acrostic Style! 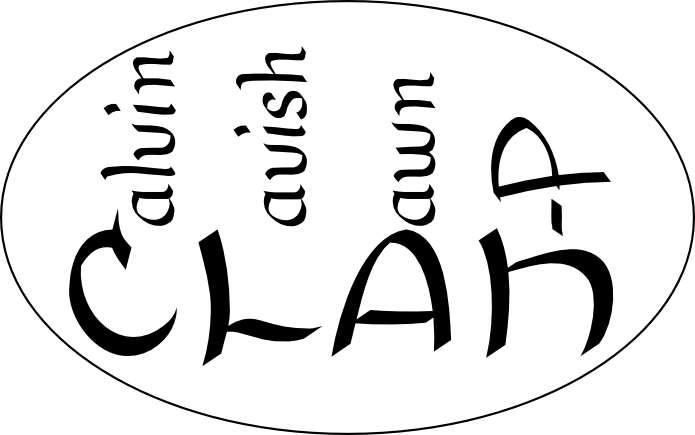 In the example to the left, the "C" of the word "CLAN" is tipped only slightly so that when it is rotated 90 degrees, it is also the "C" for "Calvin." The "L" has been adjusted a little so that it becomes the "T" for "Tavish." The "A" has a rounded top and its crossbar has been lowered so that it becomes the "D" for "Dawn." And the lower-case "n" has been adjusted to become the "J" of "J-P." You probably never thought that the letters "CTDJ" would spell the word "CLAN," did you? Perhaps the word "Clan" doesn't suit your family. You might prefer a different four-letter word, like "Home." You may have five people in our family. The word "House" has five letters. Have a family of six? "Family." Have a family of nine? "Multitude." You get the idea.